Arizona Specialty Coatings specializes in polyurethane and polyurea applications that are ideal for commercial construction. With strength, durability and flexibility polyurea and polyurethane have demonstrated the capacity to enhance safety, save money and prolong the lifetime of valuable assets. 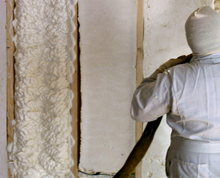 Used as insulation, polyurethane foam expands and effectively seals all cracks, cavities and crevices on the treated surface. 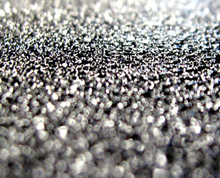 The polyurethane foam coating produces an air-tight environment that drastically reduces ambient noise, prevents build-up of moisture and dangerous molds and delivers a climate-controlled environment for exceptional energy savings. Polyurethane is lightweight and possesses outstanding strength; perfect attributes for commercial construction roofing applications. As with wall insulation applications, polyurethane completely seals the roof to deliver a durable, long-lasting water-resistant surface. A polyurea coating can be applied over the polyurethane roof (or other traditional roofing materials) for enhanced weather-proofing and to prevent surface degradation from UV exposure. Commercial construction uses of polyurethane and polyurea are expanding dramatically. The physical properties of these two poly technologies; strength, moisture insensitivity, durability and flexibility, provide the ideal material to enhance long-lasting structural integrity. 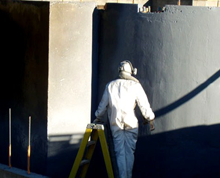 Commonly applied to concrete , polyurea provides a water-tight seal for building foundations. Polyurea coatings applied to steel structures or frames reduces the potential for damage due to corrosion and abrasion. Fast-set time, high elongation and extreme durability makes polyurea the preferred material for joint fill and caulking applications over other conventional materials. Employee safety is critical for industries today. Polyurea is used to create non-slip surfaces on structures such as floors, stairwells, ramps, catwalks etc. across wide-range of industries exposed to a number of natural or manufactured elements. The noise deadening and vibration diminishing characteristics of polyurea provide a quieter environment for enhanced productivity. Polyurea’s superior durability and resistance to chemicals, bio-fluids and moisture allow for quick and effective cleaning without scrubbing or damage to the original aesthetic of the coating.